I'm Lizzy from The House of Timber. I spend my days handcrafting specialty logo signs and squeezing in a few furniture builds when I can. I'm passionate about crafting these logo signs because I get to be a small part of so many businesses whether it's in the garage of another maker, the warehouse of a liquor company, or on the wall of a salon. Each sign has been a crucial piece in building The House of Timber and I'm in love with this maker life I've built. You can currently find me on Instagram and stay tuned to some exciting growth coming soon. 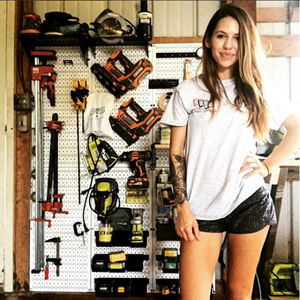 What Wall Control Pegboard Products is Lizzy from The House of Timber Using?